The thrift store was down the street from a major university in Connecticut. It is amazing how easily you get away from a world to another world. In just 2 blocks, I went from mostly white students to mostly Hispanic customers and staff. I nodded in response to the lady behind the register’s “hello” on entering. 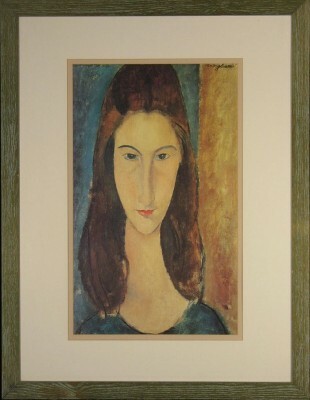 In the pile of discarded art in the back, where the art always is, I dug out a Modigliani print: “Portrait of Jeanne Hebuterne.” This print is not so rare (though this one is especially nice in its double mat and full size format.) And I only paid half price on blue tag, 50% off day. Yet, she was so beautiful, I was demanded to rescue her. As I checked out at the register, the staff lady suddenly looked utterly attractive, the same face as when I entered, but my eyes had been changed by seeing the Modigliani among the discarded art. More than a nod, I enjoyed the interaction with her greatly, even though simply showing my membership voucher and swiping my debit card. The mood of beauty had arisen. Amadeo Modgiliani, as a young artist, studied African sculpture. Tall women with elongated noses and necks were thought to be beautiful among the Maasai. The Maasai women didn’t wear high heels in the sandy bush, they instead wore ring upon ring of metal necklaces to make their neck appear longer. This African insight into feminine beauty stayed with him all his painting life. I left the thrift with a story about Modigliani hatching in me. Then the aesthetic mood flowered into insight. Elongation enhances beauty! Certain sorts of distortion enhance beauty! Like the gait of a woman with muscular dystrophy, so catching in her crookedness. Modigliani had a tall insight. I now knew the answer to Valerie’s question about the logic of wobbly stiletto shoes. And we had saved a beautiful work of art.